The first time you saw him, he was hurrying down the street, hat brim pulled low, and his cape flying out behind him like a crow’s wings. He glanced sideways and stopped on the spot. He said, “I’ve found you. Finally.” His face had a feminine quality. At first, there were long walks as he described your thoughts in illuminated detail and then tied the pieces together with insight and compassion. The world was curious with no time to cook. You nibbled apples and cheese with a glass of red. Sometimes you cried from the sheer beauty of the turn of a phrase. It was the glory of being truly known. Understood. You had to fall in love. But he changed. He became fickle and moody. Sometimes he came home after you were asleep at night or left before you woke up in the morning. He trashed the bathroom, ate all the cookies, and then told your friends you needed to lose weight. Worst of all, he became impatient with your words, tapping his foot and checking his watch. He was all drama and no rent money. Does your creativity behave like a bad boyfriend? Do you really want him back? Wasn’t he a bit over-dressed to begin with? I’m going to suggest something decidedly un-romantic. 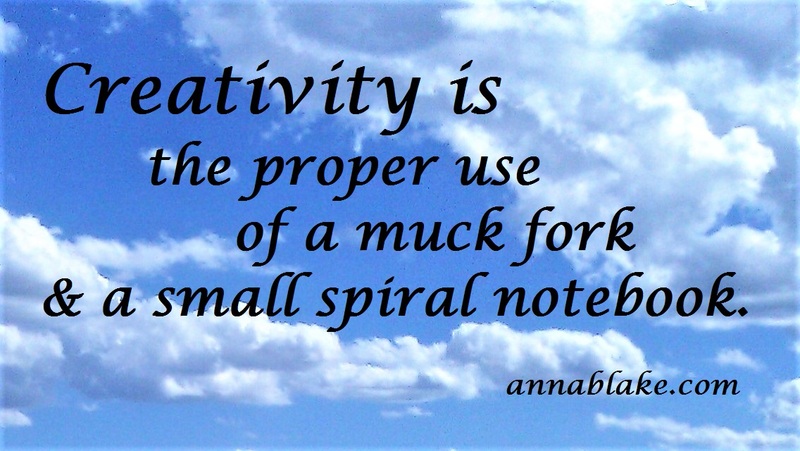 Consider replacing your dysfunctional creative drama with the proper use of a small spiral notebook. And if that’s too old school, there’s an app for that. Friends constantly told me they had absolutely no creative skill. Yet some announced their politics by paying wild attention to their appearance. Some cooked beautiful feasts, while others approached their jobs with unique enthusiasm. I saw art in sciences like medicine and space travel. Even my car mechanic seemed like a renaissance man. So, I took a breath and got comfortable. If art was brain science and cooking dinner, then it followed that life was a creative endeavor by design. Art is our birth language; it comes with our bones and skin. Our only choice is what to do with it. What if it’s as easy as teaching ourselves to say yes? If creativity could be seen as a big fat chicken, the last thing I’d want to do is grab him by the throat and squeeze him past squawking, till his eyes popped out. In other words, kindly give yourself a break. Creativity isn’t a timed test. Sitting in front of the computer, squint-eyed, coffee-soaked and knuckle-cracked while waiting for inspiration is too much drama. Besides, it makes the dog nervous. That brings me back to the small spiral notebook. I always carry one. My best thoughts come to me while I’m mildly distracted and mucking is the perfect time for brainstorming. I move slowly through the pens, letting physical muscles warm up the mental ones. As muck cart fills, I jot down passing thoughts, and all the while, get encouragement from those who help my creative process along by pooping out the hay that I worked to buy and then asking if it’s time for lunch yet. In the meantime, blog topics and plot solutions blossom in the fertile environment. It’s a creative circle if you tilt your head like a Corgi. This week: Continue your daily stream of consciousness writing but ask yourself some questions about creativity. What do you believe? How do you experience creativity in others? In yourself? Can you write an analogy about creativity, like the beginning of this post? Lay an egg of creativity; let yourself get uncomfortable and then delve into emotions, discover secrets, or just let out a rant! As usual, give yourself a few days and then share either your writing, or your experience as a result of your writing, on our Writing Herd FB page. Or just say hey; we like having you along. The bottom line is simple but sometimes a challenge to remember. We are each a work of art; individually made of star-dust and desire. You don’t have to write or paint or fly on wings to prove that. Art is the past-tense of breathing; the by-product of curating a life well-lived. Kind of redefines muck, when you look at it that way. Thank you, Linda. Of course, mucking with donkeys is especially inspirational.